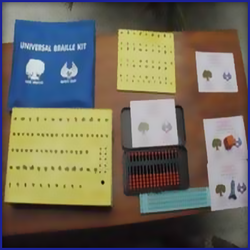 Our product range includes a wide range of tracing wheel, tactile tiles, braille typewriter, braille slate, teaching and learning material and braille writing frames. Our engineering and manufacturing expertise allows us to design and develop a range of Tracing Wheel. These wheels are designed for tracing pattern on to fabric using dress makers carbon. Our products are offered at industry leading rates and can be made available in their customised forms as per the specifications laid down by the clients. We offer these products at premium quality tracing wheel with finer, sharper teeth and smooth comfortable wooden handle. 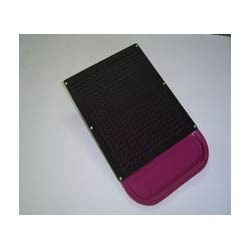 Tactile tiles used for path way, to easily access visually impaired person. Available in different colours . Easy to fit on any type of tiles. 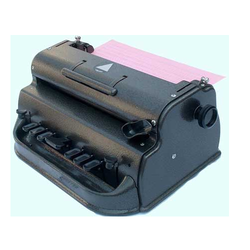 Our firm is one of the well known manufacturers and suppliers of Braille Typewriter. Intricately designed these materials are offered after checking them on set industry norms that are conducted by the quality inspectors. 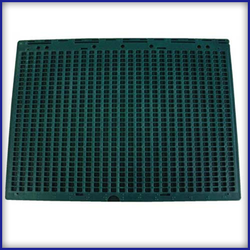 Keeping in mind the diverse requirements of the clients, we have developed these materials in different specifications. With the help of our professionals, we deliver our range within the stipulated time span. 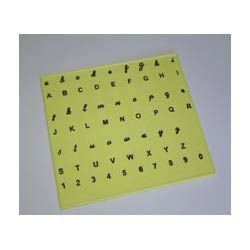 Being a client-based firm, we are involved in offering a wide and exotic assortment of Braille Slate. The offered products are easy to use by the blinds and provide them the same ease which a sighted person have while writing using pen or pencil. Post production, we test the quality and functioning of these slates at various parameters. We have gained rich industry experience in the field of manufacturing and supplying as huge range of Teaching and Learning Material. We have designed these materials for the people having mental problems. As the mentally retarded people take long time in understanding the thing, for their comfort and better understanding we have developed the materials as per the industry standards and norms. The expert team of our company manufacture and supply a gamut of Standard Plastic Geometry Set. 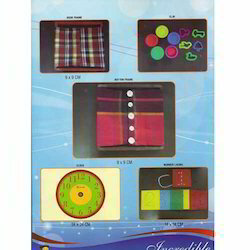 These products are especially design and reckon for visually handicapped people. These set are perfect for school home and office use. 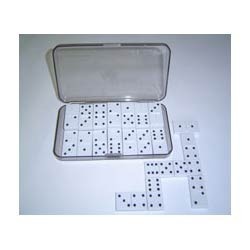 We offer these sets are wide in range of sizes and patterns at very competitive prices. 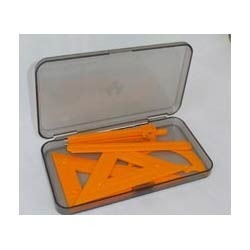 We are one of the leading companies in manufacturing and supplying Large Plastic Geometry Set. We have made our range of products by using high grade plastic material from one of the trusted vendors. Keeping in mind the desire specification of the user we manufacture these easy to use sets. These sets are available at very economical price range. 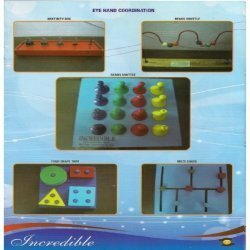 Our domain expertise has enabled us to come with a remarkable collection of Braille Kit. Braille is a language of blinds, which they use to communicate with the people. By using the wide range of our products, blinds can read the information which is raised on the kit by moving their finger tips on the dots which are made on the paper to form a word or a letter. 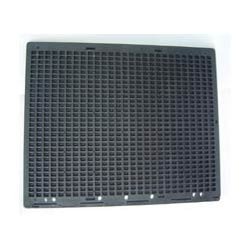 We are one of the prominent manufacturers and suppliers of a designer array of Braille Slate - Plastic - A4 Size-With Grouse. These slates are very modern in look and offer very trendy. These Slates are stylus allow for a quick easy convenient and constant method of making embossed printing. We have made our range of products by using premium quality material which are procured by our trusted and reliable vendors. 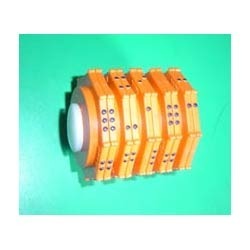 As one of the leading company we are offering Pocket Size Abacus size to our valued clients. These abacuses are very unique and exotic in design. 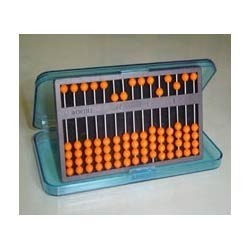 These are durable, plastic pocket sized abacus easy to use for calculation and easy to carry. We have made our range of products by using premium quality material and advance technique. The materials we use are procured from trusted vendors. Number Lacing: - Ten numbers on 4 mm MDF board of size 14cm x 14cm with the holes of 5mm dia depicting the number from one to ten shall be given with 3mm good quality nylon lace of size 60 cm (10 number). The board pieces shall be duly painted in different colours and the distance between the holes shall be aprox. 15 mm. Beads Shuttle: -Beads shuttle shall be made up of wooden frame of size 47cm x 6cm x 20 mm thick fixed with painted 5mm dia wire of size 90 – 100 cm in. 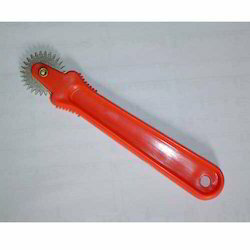 Zig saw manner. The wire shall have seven different colour beads of dia 30mm dia having hole of 10mm at the centre to move freely through out the wire. Magic Clay: - Molding Clay (plasticine) non-toxic and child friendly 5 colour molding clay preferably- Blue, Green, Yellow, red and pink each of 20 gm duly packed in suitable size 5 containers having lid colours similar to the colour of plasticine. The lid may also have different 5 types of engraved pictures of flowers, Animals & Birds so that to produce picture on plasticine when used for molding The Magic clay shall also be provided with different 5 shapes like vehicle, flower etc for creating the moulds of vehicle with the help of plasticine. The plasticine shall be kept in polythenes and then in the respective colour containers duly packed in duplex paper box. Apx. 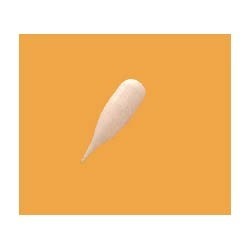 10 gm talcum powder shall also be given for easy molding purpose. Backed by our industrial experience and cutting edge technology we manufacture and supply a gamut of Dominoes Double Six. These offered ranges are set of 28 pieces. 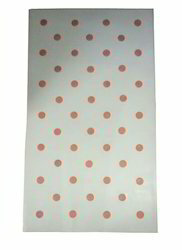 The combinations of white base with black dots are elevated easy identifications of each piece. The materials utilized in these kits are very high grade quality. The ranges of these kits are available at competitive price in the market. 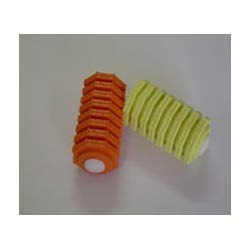 We are one of the leading company manufactures and supply a wide range of Plastic Eraser for Use with Perkins Brailler (Big). The range we offer to the client is available in varied specification to meet their diverse requirements. Our offering products are including a quality range of erasers which are used to erase the mark from paper. 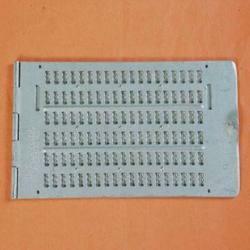 We are one of the best manufacturer, supplier and exporter of Braille Slate Plastic Pocket that are widely used for learning and writing of disable person. Complete collections of our slates are stringently tested on special parameters to make certain finest utility, quality and permanence. These are available in range of designs, sizes and dimensions and are also custom-made in accordance with the set excellence standards and specifications of our clients. Our professionals and manufacturer are expertise allows us to design and develop a range of Taylor Mathematical Frame. 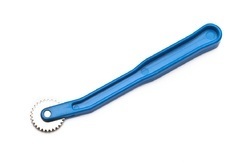 These pinions are designed are not only to safeguard the pinions offered are finely finished and smooth with perfection. Our products are offered at industry leading rates and can be made available in their customized forms as per the specifications laid down by the clients. 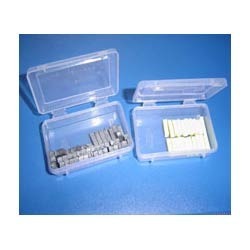 We are involved in manufacturing and supplying a wide range of Braille Word Forming Block. 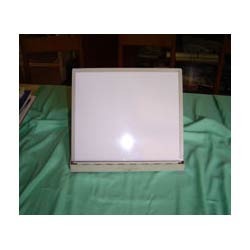 These offered ranged of products are using finest quality materials. The materials we use are acquired from consistent and authentic vendors. Offered ranged products are known for its main feature such as light in weight, easy to use, learn faster and quick. 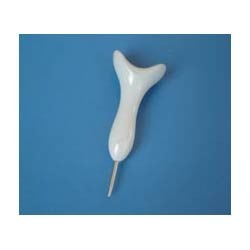 Our company offer a wide range of Saddle Stylus. These products are highly appreciated for the notable properties such as elegant designs, low space utilization and high comforts. We have developed our infrastructure on modern line to make our products as per the industry specific quality criterion. 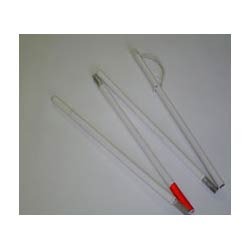 We are one of the leading manufacturers and suppliers of a vast range of White Folding Cane. Our ranges of products are extensively known for its main features such as aluminium powder coated with plastic tip and coloured reflective marking in yellow or red. Quality checked at multiple stages of these products. We are widely appreciated for our products superb quality and smooth finishing. 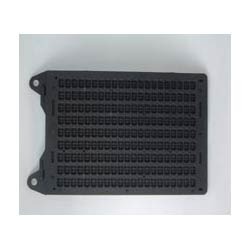 We are involved in manufacturing and supplying a wide range of Plastic Braille Word Forming. 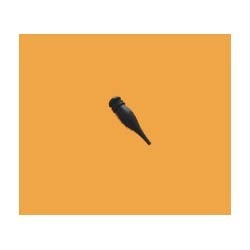 These offered ranged of products are using finest quality materials. The materials we use are acquired from consistent and authentic vendors. Offered ranged products are known for its main feature such as light in weight, easy to use, learn faster and quick. We are engaged in manufacturing and supplying an exclusive range of Low Vision Stand – Made of Metal and Plastic. Exclusively designed as per international standards, these stands are easy to operate, maintain and install. The ergonomic design, well-built construction and high advance techniques made them the preferred choice of clients. Foldable manner and adjustable angle aboard of these products are easily to carry and manage. 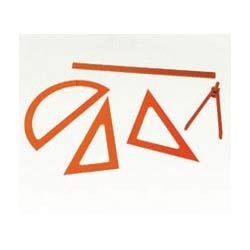 Type Sets for Mathematical Frame, Plastic or Metal which we manufacture and supply are known for its excellent functioning and the durability which we are provided to the clients. We are used premium quality materials for manufacturing these frames. The technology used for making these Frames are very sophisticated and high tech and our Frames are very high on demand in the market due to its high quality and they are available at leading market prices. Our company offer a wide range of Stylus with Steel Tip. These products are highly appreciated for the notable properties such as elegant designs, low space utilization and high comforts. We have developed our infrastructure on modern line to make our products as per the industry specific quality criterion. 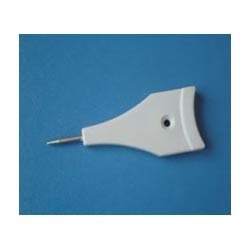 Our company offer a wide range of Stylus Pointed Tip. These products are highly appreciated for the notable properties such as elegant designs, low space utilization and high comforts. We have developed our infrastructure on modern line to make our products as per the industry specific quality criterion. We manufacture and supply a quality range of Eraser for Perkins Brailler for Use with Perkins Brailler (Small), made from quality material. These erasers are made in compliance with the specified quality norms and standards. Our range is widely appreciated and demanded by clients for their attractive look and light weight. Looking for Learning Material for Visually Handicapped ?